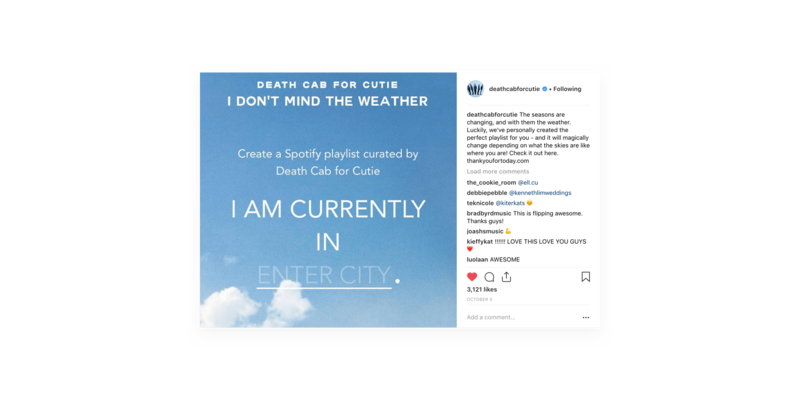 In preparation for the launch of their ninth studio album, American indie-band Death Cab for Cutie sought Hydric’s help in creating a fan-focused web experience. 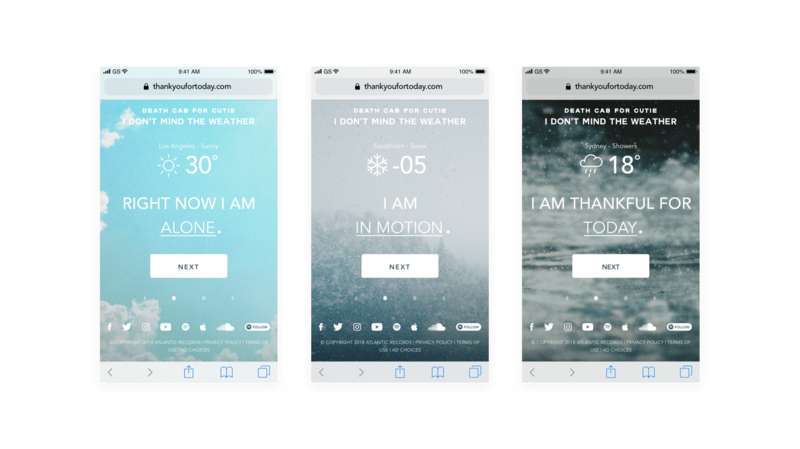 Inspired by the title of the album, Thank You For Today, and the band’s penchant for weather apps, the aim of the microsite was to provide fans a chance to take a moment out of their day to focus and center themselves amongst their surroundings. 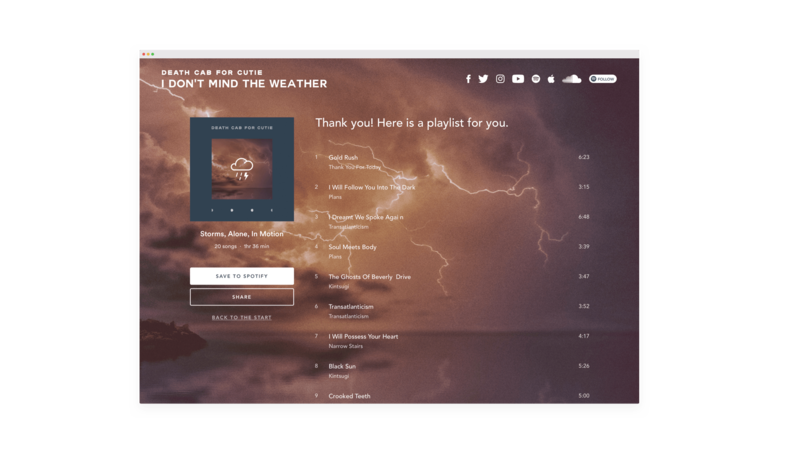 As long-time fans of Death Cab for Cutie, Hydric was especially excited to have the chance to design and develop an experience inspired by this heavily anticipated album. Knowing how integral the look and feel of the site would be in capturing the essence of the band, a heavy focus was placed on the design process. Taking inspiration from the upcoming album’s artwork, Hydric tied in small details such as using the moon phase element to track the user’s progress through the site. The site backgrounds were graded to match the grainy, retro feel of the album artwork, drawing further inspiration from the band’s Seattle-rock roots. The flow of the microsite was kept intentionally minimal to maximise user engagement and mirror the pared back design. Upon landing on the microsite, users are asked to input their location. 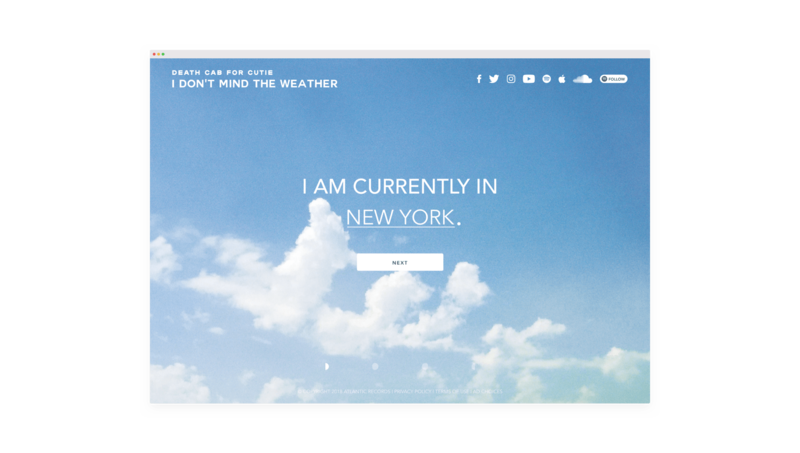 Once their city’s local weather conditions load, the site background updates to one of five weather-inspired designs to match. By mirroring the weather outside, the site seeks to prompt an awareness of your surroundings in that moment. The user is then asked a series of questions, designed to further induce a state of mindfulness. Are you alone or with others? Are you still or on the move? Are you thankful for today or tomorrow? How the user answers dictates the type of playlist they receive, with each possible variation personally curated by the band. Tracks from Thank You For Today feature heavily, as well as other songs from the Death Cab for Cutie back catalogue, and other artists particularly loved by the band. 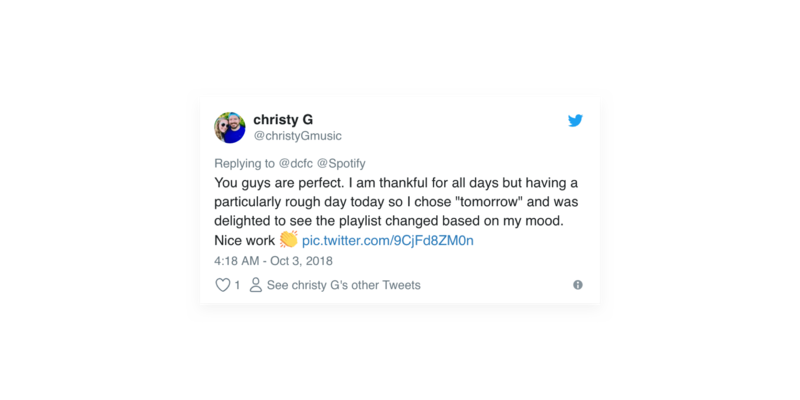 Following the official launch of the album on August 17, the Thank You For Today microsite went live in early October, earning praise from fans all over the world.